Healthy Zucchini Bread made with whole wheat flour, coconut oil and naturally sweetened with honey instead of sugar. This bread is bursting with flavor thanks to the hint of coconut, orange zest and toasted nuts. 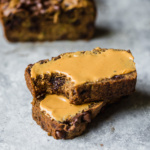 Great for breakfast and can easily be made into healthy zucchini muffins! Hello loves + Happy National Zucchini Bread Day! I’m not sure who exactly decides these food holidays but what a freakin’ calendar genius. It’s basically an excuse for me to bake my heart out, drink a margarita (on national margarita day) and celebrate my love for all things food with you. Today is definitely one of my favorite food holidays because zucchini is involved. Each Summer when your gardens are bursting with zucchini the size of your arms, I take on the challenge of creating crazy good zucchini recipes for you to try for #AKZucchiniWeek. This year won’t be any different, so if you have suggestions, I’ll take them in the comments below! 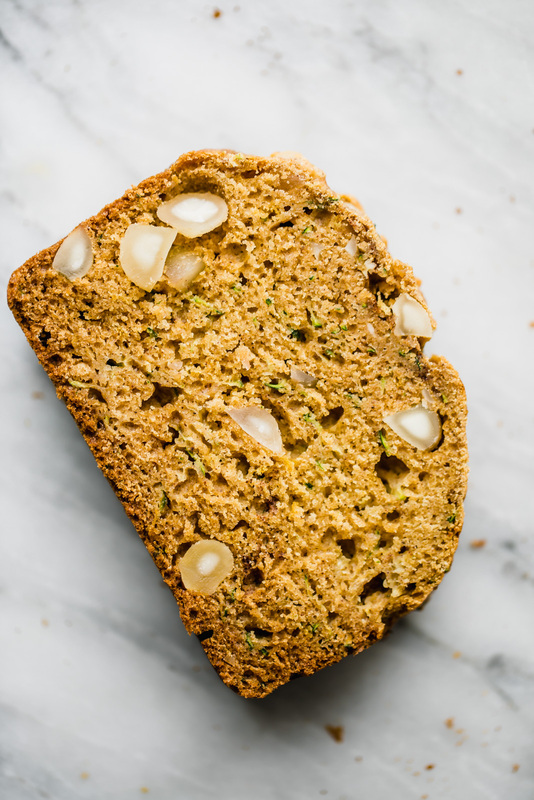 This recipe is for a simple delicious and healthy zucchini bread. It’s bursting with notes of honey, cinnamon, a hint of citrus and coconut. 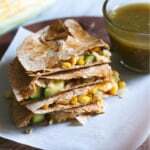 While it’s a very straightforward recipe, it’s also incredibly versatile. 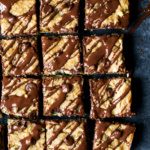 You can add chocolate chips, coconut, dried fruit or basically whatever your heart desires. Time to get wild! 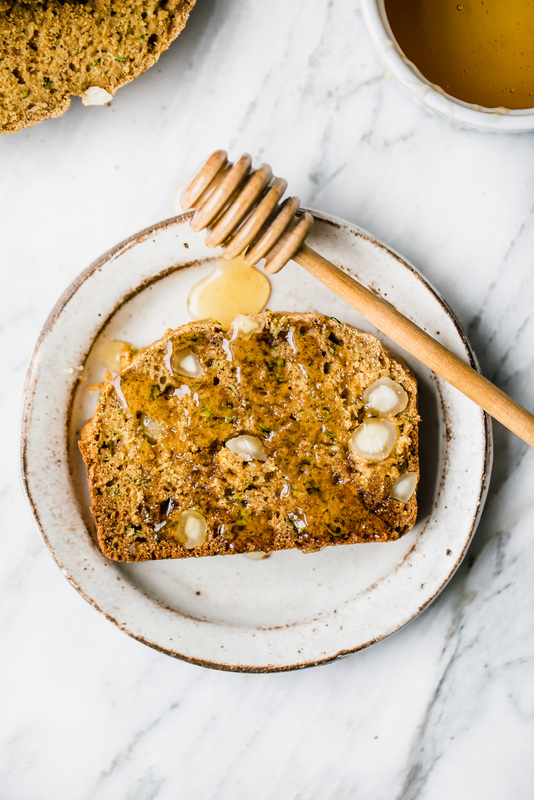 I wanted to make this bread a little bit better for you so I decided to make this sweetened with honey instead of sugar, used a small amount of coconut oil (for both flavor + healthy fats), added heart-healthy walnuts (or macadamia nuts!) to keep you full, used whole grain flour (but there are subs to make it gluten free too in the recipe below). I’m a little obsessed with this bread. I love serving it warm or slightly toasted with peanut butter. Another great way to enjoy it is with a drizzle of honey + a sprinkle of sea salt. SO GOOD. 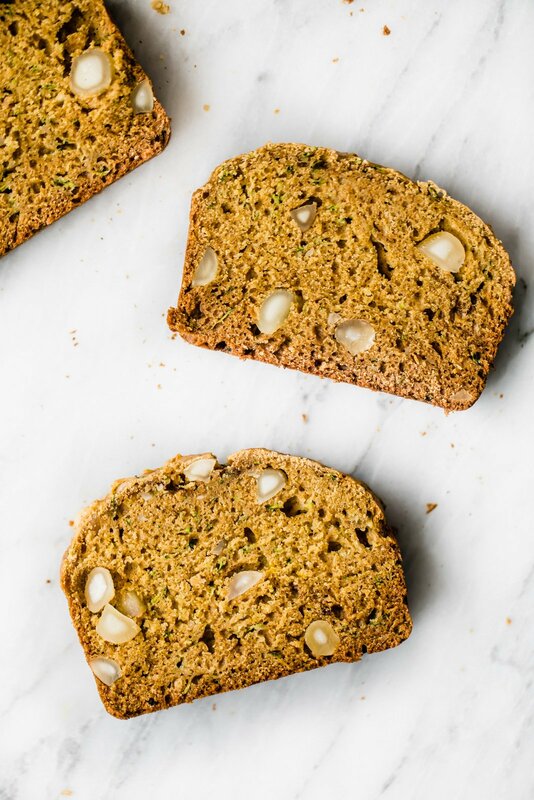 I hope you love this healthy zucchini bread as much as we did over here. Be sure to let me know how you liked it by leaving a comment below and rating the recipe. You can also upload a photo to Instagram and tag #ambitiouskitchen. Healthy Zucchini Bread made with whole wheat flour, coconut oil and sweetened with honey instead of sugar. 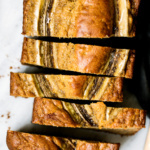 This bread is bursting with flavor thanks to the hint of coconut, orange zest and toasted nuts. 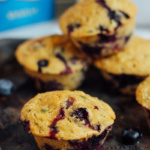 Great for breakfast and can easily be made into healthy zucchini muffins. Preheat oven to 325 degrees F. Grease a 8x4 inch loaf pan with nonstick cooking spray. In a large bowl, zucchini, honey, eggs, almond milk, vanilla extract and optional orange zest until smooth. In a separate medium bowl, whisk together the flour, baking soda, salt, cinnamon and nutmeg. Add the dry ingredients to the wet ingredients until mix with a wooden spoon until just combined. Next add in coconut oil and mix again until well combined. Fold in toasted nuts. Pour into prepared loaf pan and bake for 50-60 minutes until tester comes out clean. Transfer to wire rack to cool for 10 minutes, then remove bread and place on wire rack to cool. Cut into 12 slices. TO MAKE VEGAN: Use two flaxeggs instead of regular eggs. TO MAKE GLUTEN FREE: I recommend using chickpea flour and adding an extra tablespoon or two of milk to increase moisture. TO MAKE NUT FREE: Sub almond milk with a nut free milk and skip the nuts in the recipe. TO MAKE INTO MUFFINS: Make batter as directed. Divide evenly between 12 greased muffin cups. Bake for 18-25 minutes until tester comes out clean. 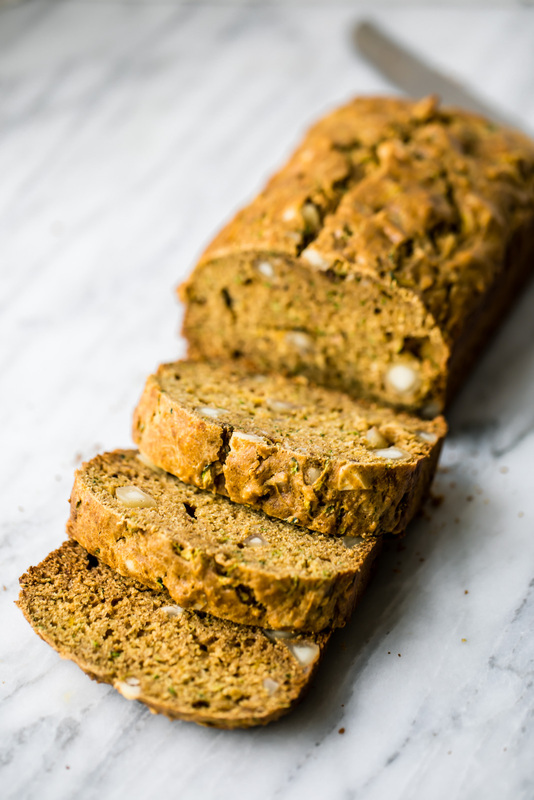 29 Responses to "Healthy Zucchini Bread"
Ahh LOVE zucchini bread! This looks so delicious! Zucchini bread is my fav!! Hope you love this one! Right?! Food holidays = the best holidays 🙂 This will be perfect for Mother’s Day! What are the small slices of something on the bread? It looks like garlic! Thank you for the vegan option! I love the way this bread looks. 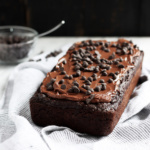 The hint of citrus sounds heavenly–chocolate chips are probably so so good in this loaf too! I made this for my 18yr old whose body is a temple…. and he inhaled it 💞 Thankyou for giving me a recipe for my whole family. 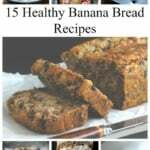 It’s really a very simple recipe and it’s very necessary to try right away. Thank you for sharing that unique and delicious recipe. It seems very good indeed. Can not wait to try the recipe. Glad these converted your niece! One of my fav breads. Would this recipe work if I subbed maple syrup for honey? Thanks! This sounds so yummy especially with the citrus! Any chance I could make with with almond meal? It’s delicious! I wouldn’t recommend using almond meal as it will change the consistency of the bread.